This semester, Tutors for All worked at four different locations: Codman Academy Public Charter School, Jackson Mann K-8 School, MGH Center for Community Improvement, and Maurice Tobin School. Our students ranged in age from 4th grade to college. We measure our results many different ways, the most famous and standardized method being MCAS scores. It will be a few months before these scores are released, but we have already measured growth with our own tests, called “Show What You Know” (SWYK). These tests reflect the math or English standards that students should meet to be successful at their grade level. They take the test at the beginning, in the middle, and near the end of a program. 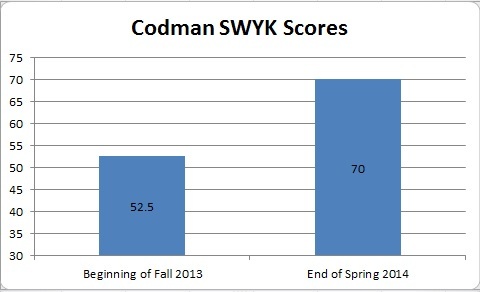 Codman is our largest and longest run program, and serves both 9th and 10th graders. We have tracked the growth of our forty-eight 9th graders over the last two semesters. Of students who have taken the SWYK at least once each semester, the average score at the beginning of the year was 52.5%. Now it is at 70% – a 17.5% increase. Jackson Mann is our youngest program, teaching 4th grade math. Over the last semester, the average score went from 52.8% to 67.78%, an increase of 14.98%. One of our students increased their score from 43.33% to 78.57% in ten short weeks. Beyond academic achievement, this student also gained confidence in their abilities – an invaluable part of fulfilling their potential in the future. Tutors for All has a successful history with Tobin. In 2012, the 6th grade cohort we tutored achieved a math MSGP of 87. This semester, we enthusiastically renewed our relationship with the school. If SWYK scores are any indication, our tutors have really helped their 5th grade students. 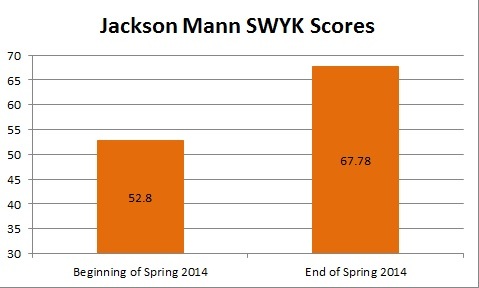 97% of our 50 students showed a marked improvement on their SWYK scores throughout the semester. Overall, individual students’ scores improved an an average of 14.6%. The majority of students (62%) improved more than 15%, and 28% of students improved their scores by more than 25%. Among these students we had a few superstars. 3 students, or 6%, improved their scores by more than 30%. One student went from scores 55% on their exam to 97%! Five other students tested out of the 4th grade level curriculum and started working on 7th-9th grade curriculum instead. These statistics show that individualized instruction can create fantastic results in a relatively short amount of time. When students are given the attention they need, they succeed. This entry was posted in Results, Tutors for All Blog: One Student at a Time on April 25, 2014 by Mark Destler.